﻿ HuntingNut » Forums » Firearms, Shooting & Reloading » Gun & Firearm Discussions » Glock Out!!! Posted: Sun May 02, 2010 8:20 pm Post subject: Glock Out!!! 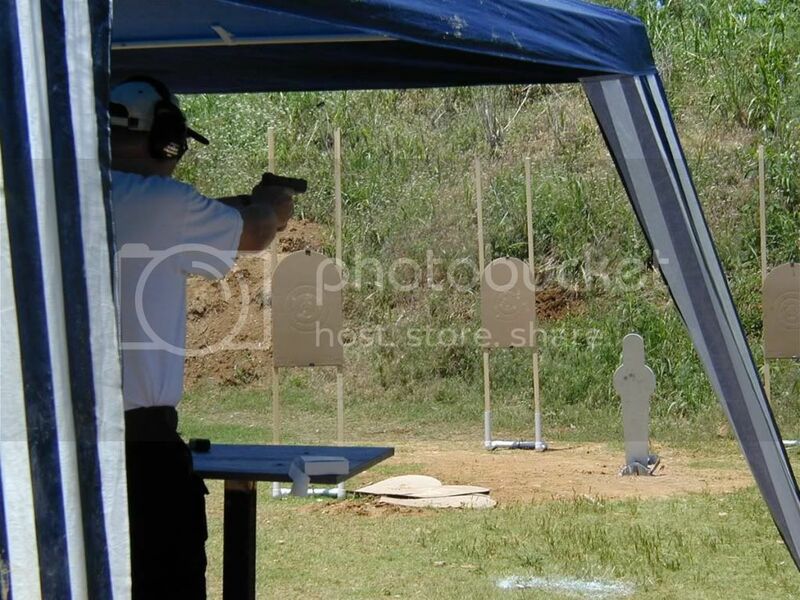 The Glock Sport Shooting Foundation (GSSF) had the "Glock Out" this weekend at the Dallas Pistol Club. I think I've only missed one of these events in the last 15+ years. They are really well done and open to anyone with a Glock and joins the GSSF. They have a Glock technician there to check out your guns. The gave me old .40 a new recoil spring, replaced a superseded part in my 9mm, and replaced two mag springs that had taken a set from age. All at no charge. The shooting is fun, safe, and meant for all skill levels. Usually 400 to 600 shooters show up and are divided up into multiple classes. Prizes go to the top shooters, then the 33 %tile and 66%tile (you don't have to win to get a prize). Here is the GSSF Website and schedule if your interested. It was a great day. I shot my .40-cal long-slide (Glock 24 with a comp) and a standard Glock 17 9mm. I turned in my personal best today. After 4 runs through the falling plates with my G24C, I switched to my G17. After the first run with the 9mm, I told the safety officer I thought I had the rhythm! I then broke into the 5 second range to clear 6 plates, then 2 strings in the 4 second realm!!! Again, my personal best. This is the falling plate set-up. Here is another venue called the "Glock M". It has a total of 5 targets at staggered ranges, two paper on the left, a popper in the middle, and two more paper on the right. Two shots go in each paper target and you have to hit the popper once. Posted: Mon May 03, 2010 4:14 pm Post subject: Re: Glock Out!!! Congrats on the personal best !!! I don't see a holster ??? What distance do you shoot the plate rack ? Posted: Mon May 03, 2010 5:35 pm Post subject: Re: Glock Out!!! They have the shooters bag their pistols. No firing from a holster. Some of the shooters are pretty "green" and this keeps things safe. Minimum distance to the plates is supposed to be 11 yards but can be longer at the discretion of the range safety officer. Posted: Mon May 03, 2010 9:09 pm Post subject: Re: Glock Out!!! Well done Slim...6 plates in 4.77 secs is no mean feat by anybody's standard mate. 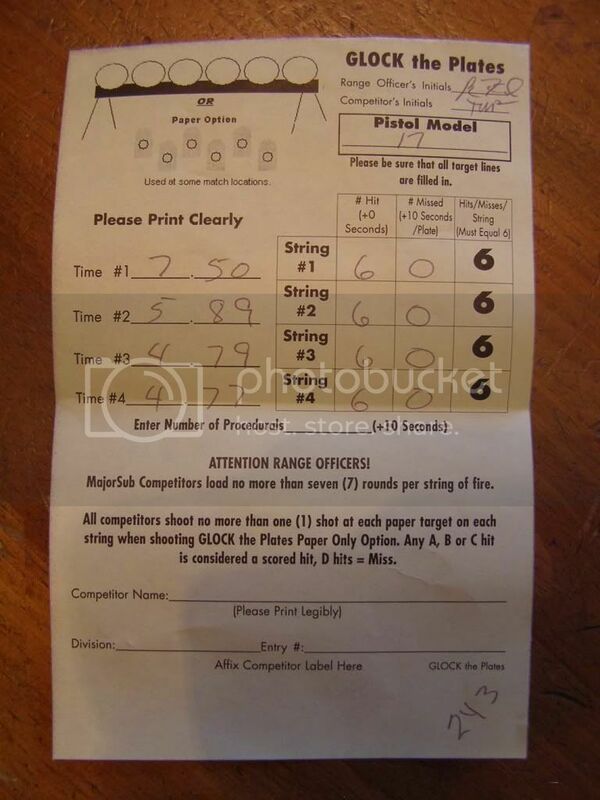 Been many years since I shot plates...but I remember how difficult it is to score all six quickly. Posted: Tue May 04, 2010 4:58 am Post subject: Re: Glock Out!!! Thanks Vince! It was a ton of fun. I need to do this more than once a year. The Dallas Club has some plate matches once a month but they are always on Sunday morning. Posted: Fri May 07, 2010 2:19 pm Post subject: Re: Glock Out!!! Your forgot to sign yer ticket man! My bud has a Glock in .40cal for his service weapon. He's got to be the best shot ever. Nice ride too and I like it. This guy is presicion like with the thing and it's a very welll regulated pistol and man does it hit. I don't like it when he shoots my stuff as he's WAY better than I am with my guns! 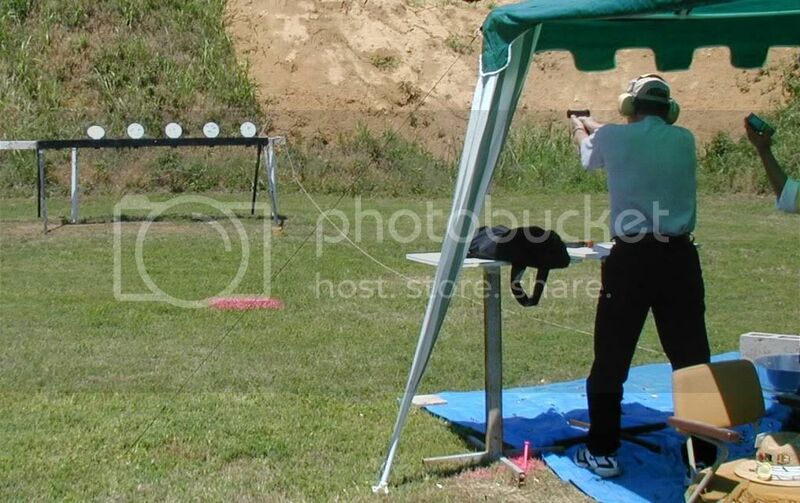 I've never shot in competition and I bet that's a little nerve wracking! Good going man! Check out the "0"'s in the center colum! Posted: Fri May 07, 2010 4:01 pm Post subject: Re: Glock Out!!! Only had to initial the top right corner. They are really good at these matches making sure newcomers aren't rushed, stay relaxed, and safe. Posted: Fri May 07, 2010 7:10 pm Post subject: Re: Glock Out!!! Stellar results and a good looking venu to boot. Posted: Wed May 19, 2010 11:49 am Post subject: Re: Glock Out!!! Great Job Slim! Gonna buy a new Glock know? Posted: Wed May 19, 2010 5:30 pm Post subject: Re: Glock Out!!! Gonna buy a new Glock know? The Glocks I have are doing what I need (G17, G22, G24C, G26). I only use three of them regularly. Thus no new pistol in the firearm purchasing plan. Posted: Wed May 19, 2010 6:11 pm Post subject: Re: Glock Out!!! Thats to bad! I dont see a 10mm in yer lineup. They are loads of fun to! Posted: Wed May 19, 2010 7:47 pm Post subject: Re: Glock Out!!! I dont see a 10mm in yer lineup. the 10mm grip is a bit big for my hand. I've heard of successful hunting with it. Glock used to sell an extended barrel for that specific purpose. Posted: Thu May 20, 2010 6:15 am Post subject: Re: Glock Out!!! Posted: Thu May 20, 2010 6:42 am Post subject: Re: Glock Out!!! I have fired one of those, a very interesting experience! The shooting technique is to aim at the crotch, pull the trigger, and let-up when the sights go above the head. You can't aim center of mass and hold the gun there while firing. Boy it was fun!!! Doesn't take long to empty the 33-round magazine!!! Posted: Thu May 20, 2010 6:45 am Post subject: Re: Glock Out!! !